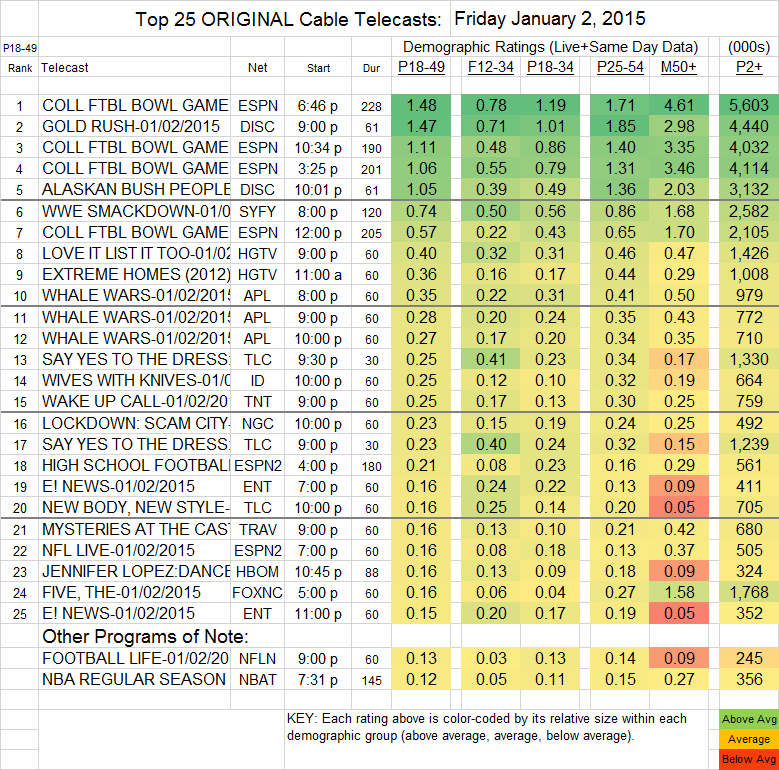 NETWORK UPDATE: There were no changes from the preliminary ratings for Friday night. ESPN continued its holiday season rule with 3 of the top 4 cable shows of the day or night, COLLEGE BOWL games at 1.48/1.11/1.06, and another in 7th place at 0.57. Discovery also had a strong night, with 1.47 for GOLD RUSH and 1.05 for ALASKAN BUSH PEOPLE. SYFY’s WWE airing was at 0.74, steady with last week. TNT’s WAKE UP CALL gained 0.09 to 0.25. Animal Planet aired an entire night of WHALE WARS at 0.35/0.28/0.27. In response to a reader query, OFF THE MAP (GAC) was at 0.02/0.02 with 38K/33K total viewers.